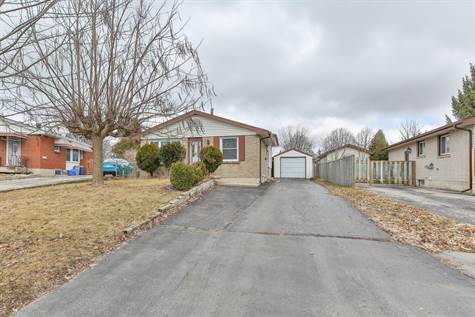 This awesome home near White Oaks is for anyone who needs space for their parents, kids, teens, hobbies, man cave or whatever else life has in store. Situated close to nature trails at Westminster Ponds and with easy access to the 401 and White Oaks shopping, everything is close at hand. This bright 4 level back split has a flowing main floor plan with dedicated living and dining rooms offering easy access to the kitchen. Upstairs has 3 large bedrooms and a nice 4 pc bathroom. Downstairs, there's a complete suite with a bedroom, large living room, and a huge kitchen plus a 3 pc bath. Other bonuses include an owned water heater, covered BBQ area in the backyard, a shed, plus a garage and driveway with lots of parking. Nicely updated and carpet-free, this home has been well-maintained and is ready for you. This house is sure to impress.